Face of Jules’ oxygen dome therapy is a highly-effective facial treatment that will thoroughly refresh and reinvigorate your skin. During this treatment, our esthetician places a dome-shaped mask on the client’s face, providing complete coverage from top to bottom and side to side. This dome is in turn connected to a machine that takes in outside air and through its process creates pure oxygen (90% high concentration) as well as anion. It is this refined oxygen and anion that naturally stimulate skin cell regeneration. There are many important benefits to having oxygen dome therapy at Face of Jules. The purified oxygen involved in the treatment efficiently regenerates decaying skin cells and reduces detrimental lactic acid. Anion, termed a “vitamin in the air” for its own benefits, helps promote blood circulation, activate cells and give the immune system a very helpful boost. 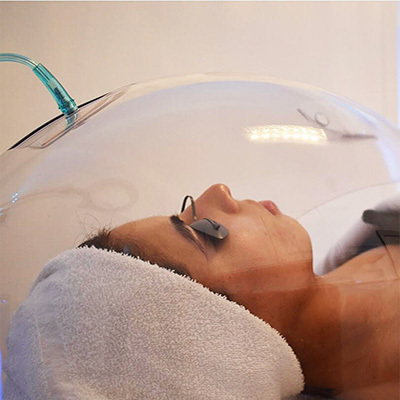 Acting together within the dome mask, the oxygen and anion will revitalize your skin, improving fine wrinkles and other signs of aging. When this comfortable facial therapy is over, you’re left with youthful, glowing skin. To schedule an oxygen dome treatment, signature facial, or any of our other exceptional skin care treatments, please give us a call now at (310) 770-8730. Ready to heal and rejuvenate your skin?